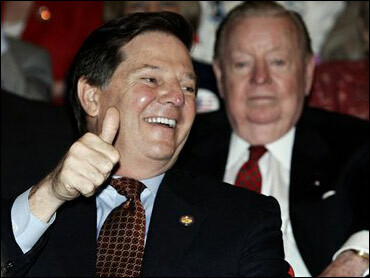 Democrats wanted to investigate Majority Leader Tom DeLay and have the House ethics committee run as it had since 1997. They won on both counts. The minority party forced Republicans on Wednesday to vote for reversal of new GOP rules for investigating House members and staff. Reversal was the Democrats' price for ending a deadlock on the evenly divided committee. And one of the revived ethics committee's early jobs is likely to be an investigation of DeLay's foreign travel. The Texas Republican says he wants an inquiry to clear himself of accusations that some of his trips were financed by a lobbyist and his clients — in violation of House rules. The Republican ethics chairman, Doc Hastings of Washington State, already has offered to launch an investigation. Before the 406-20 vote Wednesday to revert to previous ethics rules, DeLay repeated his request to appear before the committee to defend himself. He told reporters his staff is collecting records "going back 10 years or more" for voluntary submission to the House's internal investigators. He also said the ethics panel must give clearer guidance on privately financed travel by House members. Kenneth Gross, a lawyer and congressional ethics expert who has represented both Democrats and Republicans, told CBS Radio News that a DeLay inquiry could pose problems for both parties. "That could be the biggest issue here: Congress itself being on trial, not just Tom DeLay," Gross said. Gross added that GOP ethics committee members would have to rise above their personal ties to DeLay. "They all have some connections to him. In fact, his political action committee has made contributions to them," Gross said. Democrats were able to force the Republicans' hand because the ethics committee has five members from each party and needs six votes to begin operations in a new Congress. The minority party refused to provide the sixth vote unless the new rules were jettisoned — especially a provision that would have allowed one party to withhold votes and thus force dismissal of complaints. In debate Wednesday evening, Republicans wouldn't admit their rules were a mistake, and Democrats insisted they were written to protect DeLay. "We were absolutely right," said Rep. David Dreier, R-Calif., arguing the GOP rules were fairer to members under investigation. Rep. Louise Slaughter, D-N.Y. countered, "When they thought no one was looking, they passed a package that effectively neutered the committee ... to protect one man from investigation." Hastings, the chairman, told the House, "It is severely damaging to this institution for the other side of the aisle to keep the doors locked on the ethics committee." Senior committee Democrat Alan Mollohan of West Virginia argued the Republican rules would seriously damage the committee's ability to investigate. "What is at issue is ... whether the House is going to continue to have a credible ethics process." DeLay, R-Texas, was admonished by the committee on three matters last year. Early in the day, he was clearly annoyed as he emerged from a closed Republican meeting and found himself in a mob of reporters. "You guys better get out of my way," he said. "Where's our security?" Hours later, DeLay seemed jovial at a news conference where he pledged to support the reversal and defend himself before the committee. He also denied he had anything to do with the Republican rules changes. "This has been the speaker's project all along," he said, referring to Speaker Dennis Hastert.